Since you can't paint those dorm walls pink, go ahead and make a pink college dorm rug the main attraction of your dorm room. That's exactly what rugs for college add to dorm rooms: looks and style! An area rug for college should be on your dorm shopping list if you want your dorm to look its best. While there are plenty of dorm decorating ideas and dorm decorations out there, wall posters and other dorm decor items still can't decorate floors! 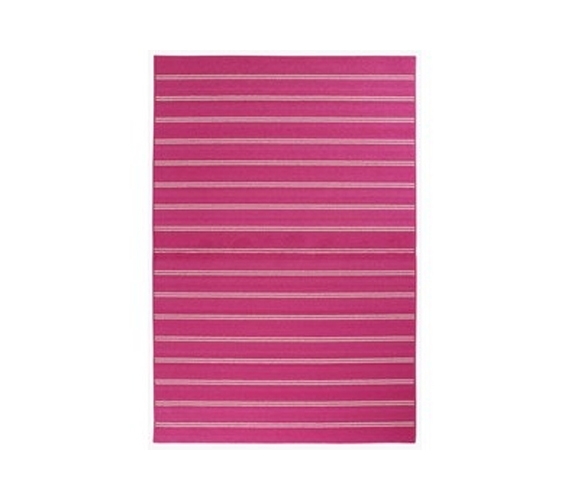 It's true that dorm rooms are small, but this Classic Stripes College Rug - Pink would decorate and cover up otherwise wasted space! Having a cheap rug will also leave your feet much better off. College life involves plenty of walking, and by the end of the day, those two feet will be looking for a break. Sure, you might wish to toss them up to rest on a dorm trunk or other dorm item, but give them the right treatment from the moment you step in. This made-in-the-U.S.A. rug will be worlds softer than that hard floor beneath, although it's so pretty you might not want to step on it! Go ahead and step all over it. Dorm rugs were, after all, made to be stepped on—and in the case of this pretty pink rug, made to look fabulous!